We have some feasts of Saints coming up this week. On the 24th is the feast day of Saint Sharbel Markhluf (1828-1898) of Lebanon. He was known for his strict fasts and great devotion to the Blessed Sacrament. We should pray to him specifically for peace in the Middle East. On July 25, we commemorate the holiness of St. James who was the first of Christ’s Apostles to be martyred. 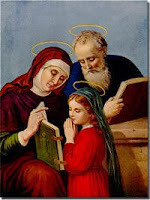 The following day is the day of Saints Joachim and Ann, the parents of Our Lady. St. Ann specifically is a very popular Saint, known for her powerful intercession in behalf of the many requests directed to her. We might reflect upon her as a wife and mother and also consider the St. Joachim and their child Mary. They give us an example of a true family. The family is the nucleus in which a person first learns human love and cultivates the virtues of responsibility, generosity and fraternal concern. Strong families are built on the foundation of strong marriages. Strong societies are built on the foundation of strong families. Governments acknowledge, respect and support marriage, in which a man and a woman join together in a lifelong commitment. An undertaking indeed vital for the flourishing of future generations. The government is supposed to serve the family and not the other way around. The traditional family as we know it has been around for thousands of years -- and for a good reason. First and foremost is that God instituted the family when he created the first two human beings. He told Adam and Eve to be fruitful and multiply. Thus, He made the institution of marriage, the purpose of which is mutual love and the begetting of children. That first family was considerably weakened because of original sin. But, then we were given the example of God's plan for family life in Jesus, Mary and Joseph. Secondly, because the family is God's doing, keeping it intact is the only way for true happiness and wellness of mind and body for wife and husband and children. Children in the family have fewer behavioral problems and do better academically and economically. This was one fact pointed out in the book Why Fathers Count: The Importance of Fathers and Their Involvement with Children by Sean Brotherson and Joseph White (Men's Institute Press). H. Wallace Goddard, a University of Arkansas professor, wrote a chapter of this book in which he states that the current dating culture does not prepare couples for strong and stable relationships in marriage. Nor does it help them to deal with difficult periods in marriage. When there is a strong relationship between husband and wife, there is a much greater probability that they will be good parents and that they will be a close knit family. This is effective in guarding children from problems such as drug use, promiscuity, depression and suicide. A laissez faire attitude towards marriage and the family does not help. Changing the definition of marriage will have its negative effects. The government needs to protect what we have come to refer to as the traditional family: husband (man - father), wife (woman - mother) and children. Stable and happy families cause a stable and happy society. Otherwise our future is bleak.